Trinity Designs: Hey there, Cupcake! I know I mention my Stampin' Fools here a lot! They are one of my party groups that meet each month to stamp, stamp, stamp - they love it! And I have to say that they are just a joy to be around. We always have the best evening together and they are so good for my ego - they love everything I make. This makes my heart so happy! I'm even lucky enough to see a few of them twice a month when they come to stamp with me at the Manassas Volunteer Firehouse. Stampin' fun all around! So this last month, Pam was the "hostess" and I wanted to create something special for her. I'd just gotten my Create a Cupcake stamp set and coordinating punch and thought I'd pull them out and see what I could do with them. I ended up making this fun covered notepad just for her! Since I've been cleaning out the studio and slowly rearranging everything, I've 'found' a LOT of alterable items that I'd bought because I just KNEW I could do a class with them! For Pam's gift, I started with a cute notepad that was printed all over with cupcakes! Perfect! I removed the magnetic strip from the back carefully so I could re-use it. Next, I covered the notepad with a piece of Pretty in Pink cardstock that I'd run through my Big Shot with the Perfect Polka-Dots embossing folder. The cardstock wrapped around the back of the notepad, covering where I'd removed the magnet so it looked pretty. I then used my Tombow Multi-Adhesive to re-adhere the magnet. This way, she gets maximum hold when she puts it on her fridge to use! Next, I focused on decorating the cover. I kept it simple and used a piece of Early Espresso cardstock that was border punched top and bottom with the Scalloped Edge Border punch. I layered it with a piece of Whisper White that had two ribbons wrapped around it - Pretty in Pink 5/8" Grosgrain and 1/8" Early Espresso Taffeta. 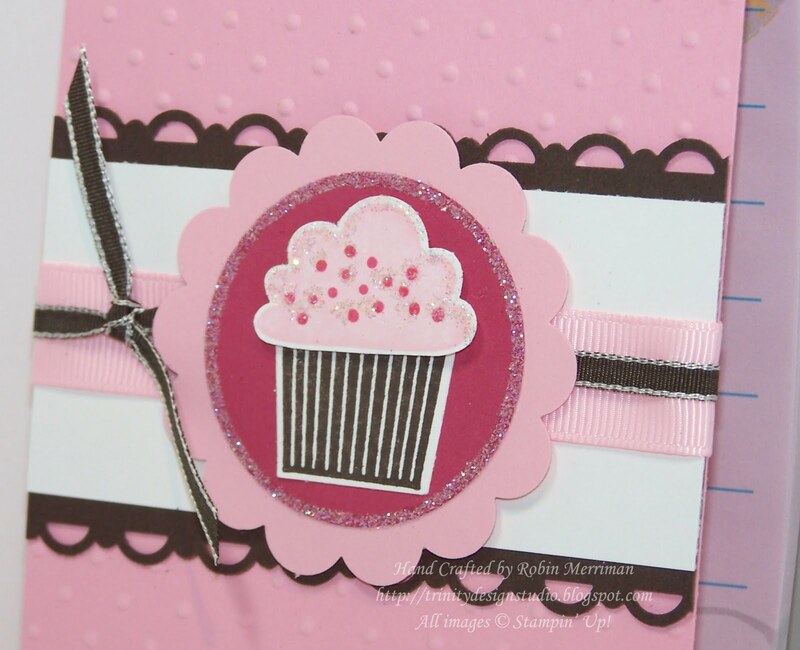 The Pretty in Pink Scalloped Circle was punched out with the 2 3/8" Scalloped Circle Punch - I know, duh! And I layered it with a piece of Rose Red cardstock punched out with the 2 1/2" Circle Punch. They were layered on the Rose Red circle and then I added some Dazzling Diamonds Glitter for just a touch of bling. So cute! I was really happy with the finished one! And the best part is that Pam loved it too! 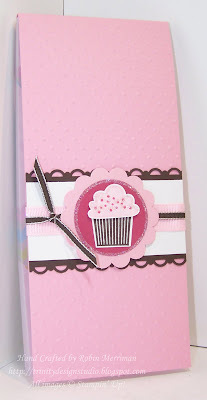 This stamp set and punch are in the Occasions Mini Catalog which goes until the end of April. But, remember, if you NEED them and are placing an order for them, do it by the end of March so you can earn FREE Sale-A-Bration product rewards! For each $50 you spend, you get FREE Stampin' Up! That's a pretty sweet deal! My online store is open 24/7 for you, so pay a visit and find what you need to make lots of pretty things! LOVE it!!! Gotta CASE this one! Makes me happy just looking at it!